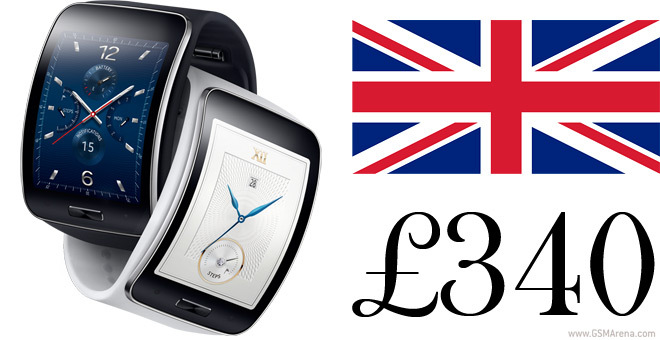 The Samsung Gear S watchphone will be arriving in the UK a week after the Galaxy Note 4 hits. The Tizen-running smartwatch has its own 3G modem so it can do calls and use mobile data on its own, no need for a connection to a smartphone, unlike the majority of smartwatches out there. The Gear S comes in Black and White but only the Black version will be stocked at first. MobileFun is taking pre-orders at £330, while Clove is asking £340. Clove notes that black Samsung Gear S units will be available on October 24, the availability of the white option is yet to be confirmed. Of course, there’s a Swarovski edition, but let’s say that one has a unique, uh, charm. The Gear S has a large (really large for a watch) 2″ screen, a 360 x 480 Super AMOLED, a dual-core 1GHz processor, 512MB of RAM and 4GB storage. It can play music to your Bluetooth headset and make calls even without one. And it’s IP67-certified so light sporting activity is no problem (just no diving, okay? ).